How is Solar Energy Produced and What are the Different Types of Solar Systems? With over 300 sunny days in most locations throughout the year, India is an ideal country when it comes to solar energy. It is because of this tremendous solar potential that the Central Government has set a target of achieving at least 100GW of installed capacity from solar in a bid to move towards renewable sources of energy. While this 100GW is to be achieved in defined proportions from rooftop solar and ground mounted solar, solar as a fundamental technology works identically for both the cases. Solar PV (Photovoltaic) modules, which contain cells which are connected in series, are typically placed on rooftops or ground. When the sun rays strike them, they convert sunlight into direct current (DC) electricity. Since our home appliances run on alternating current (AC), it is mandatory to convert this generated DC power into AC. This is achieved by installing an Inverter. The output of the inverter is generally connected to the building mains. But for large consumers like commercial or industrial buildings, where the solar system size is bigger, say more than 100kW, we may need to step up the voltage to 11kv or 33kV by using a step-up transformer. In this case, the output of the inverter is connected to a step-up transformer and the output from the transformer is connected at the main HT panel (11/33kV). In India, there are generally three types of solar systems that are most common: Grid Connected, Off Grid and Hybrid. Grid connected systems also known as on-grid systems, are connected to the building mains and supply power to the connected load as long as the grid is energized. Priority is first given to the generated solar power and only if the consumption is more than the generation of the solar system, is the grid power sourced. Solar inverters come with a special security feature called Islanding protection that prevents backflow of solar power to the grid, in the event of a grid failure. 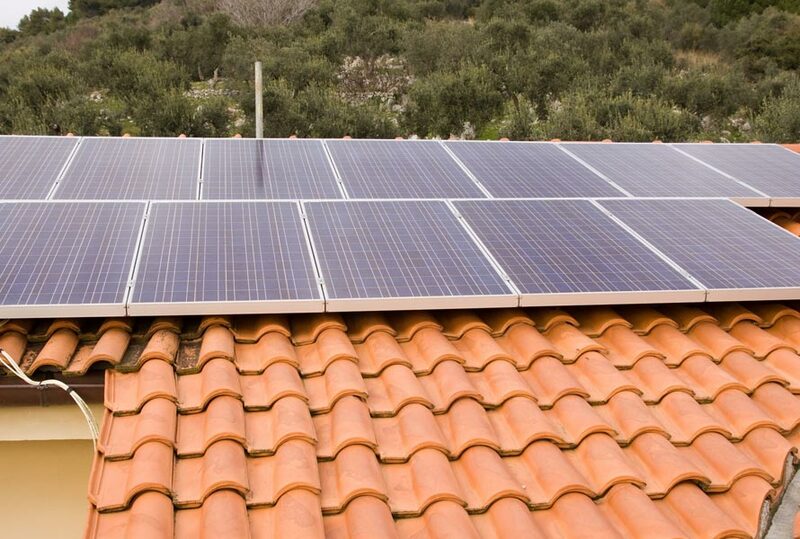 If you opt for a grid connected solar system, you are eligible to make an arrangement called Net-Metering. This is a special arrangement with the approval of your local Distribution Company (DISCOM) that allows you to optimize the utilization of generated solar power. With net metering, the extra solar power generated is fed back into the grid, and the customer is accordingly compensated by the DISCOM. Off-grid solar systems are set up independently from the state grid. Here generated solar power can be supplied to the dedicated load with the help of a battery backup system. When generated solar power is more than the load requirement, extra power can be stored in the battery and the same power can be utilized in the event of low generation or during non-generation hours. Off-grid systems generally are less efficient than the on grid systems and are more expensive, requiring the battery to be replaced every 5 years. These are recommended only for areas where there is no power or a very erratic power supply. A hybrid system, as the name suggests, is a combination of on-grid and off-grid solar system. A hybrid solar system has a battery bank with an inverter which can work as an on grid as well as an off-grid system. Generated solar power can be utilized to supply connected load or for charging the battery bank. Just like an on-grid system, any extra power generated by the hybrid system can be supplied back to grid, if the battery is fully charged. In the event of grid failure, just like an off-grid system, the energy stored in storage batteries can be utilized for supplying to the dedicated load connected to the system. Hybrid systems can also have other sources of power such as DG or wind alongside solar and grid. Taking a little deeper dive into technology, we can broadly categorize Solar PV into crystalline silicon and thin film. Crystalline Silicon can be further categorized into mono and multi-crystalline silicon whereas thin film can be categorized as amorphous silicon, Cd-Te (Cadmium Telluride), CIGS (Copper Indium Gallium), CIG (Copper Indium Gallium) etc. The main difference between these is the material that they use as well as their manufacturing processes. Generally, multi-crystalline silicon is used in most solar systems and has a proven generation record of more than 30 years. Multi-crystalline comprises of 80-85% of the overall market share. If you are considering going for solar at your home, office, industrial or commercial building, there are also a couple of ownership models that you can choose from. You can choose to install and own the solar system (CAPEX Model) or just purchase the solar power from a system owned by a third-party/ individual and you only have to pay for the energy consumed at the rate that has been contractually agreed. In case you wish to own the system, you will have to bear the cost of the system, there are however numerous bank financing options available (RESCO Model). In case you decide to only buy solar power, you will have to lease out your rooftop/ ground area to the third-party that you sign the contract with. With options galore and cost for going solar coming down substantially in the last few years, there is absolutely no excuse for you to not go solar. The grid tariffs are set to continue to rise over the next several years, and solar gives you the luxury of a low fixed tariff, prompting major savings on your electricity bill, over the next 25 years. Going solar is like discovering a pot of gold, especially for industrial and commercial users. Since solar requires negligible maintenance too, it is as good as planting a tree and enjoying the benefits of it for several years to come. What’s more is that you make your contribution towards reducing the carbon footprint and set an example before everyone prompting the march towards solarization. Arpit leads marketing and product at MYSUN. An Aerospace Engineer by education, he is extremely interested in Football Management. He is most active on Twitter and can be found @RedArpit. Without battery ,solar system can work? You can find the details on how you can get in touch with us here: itsmysun.com/contact-us/. The contact details are also available on the same.